This page may require cleanup to meet basic quality standards. The specific problem is: Links Broken. Outdated fixes. You can help by modifying the article. The discussion page may contain useful suggestions. 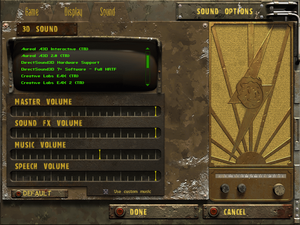 Previous Interplay-published version supported OS X as well. Upgrades version 1.13 or 1.25 to version 1.27. 1.26 Tactics Editor tools are included too. The GOG.com version is pre-patched to version 1.27. InstallShield installer won't work if you have the Steam version. Use the repacked patch and then fot127cdremover instead. 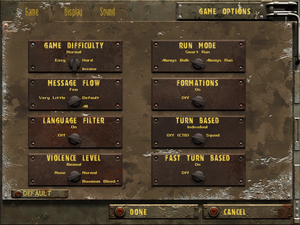 Supports the US 1.27 and the German 1.25 versions. Error when using with unpatched Steam version. From the Fallout Tactics Bonus CD and adds the Springfield bonus patch. 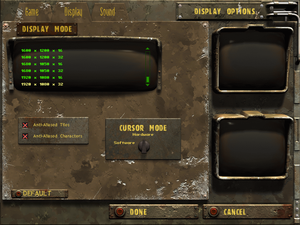 To be able to play it you'll need to be in the first Fallout bunker before applying this patch. 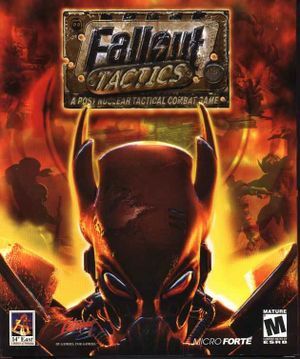 See Fallout Tactics Hi-Res Patch v1.0. Only use if experiencing missing items in inventory. Download and apply Missing Inventory Patch. ↑ 2.0 2.1 File/folder structure within this directory reflects the path(s) listed for Windows and/or Steam game data (use Wine regedit to access Windows registry paths). Games with Steam Cloud support may store data in ~/.steam/steam/userdata/<user-id>/38420/ in addition to or instead of this directory. The app ID (38420) may differ in some cases. Treat backslashes as forward slashes. See the glossary page for details. This page was last edited on 6 March 2019, at 07:58.